Happy New MacBook Pro day everybody; Apple has upgraded the processors in its Retina display line and even lowered the price too. The new MacBook Pros come in 13- and 15-inch sizes, with Apple's own Retina display tech providing eye-watering resolution with 326 pixels to the inch. The 13-inch MacBook Pro with Retina is available with a 128GB flash drive for $1499 - that's a saving of $200 compared to yesterday. In the UK, you're looking at £1249 versus the previous price of £1449. Also in the 13-inch size is a model rocking a new 2.6GHz processor backed up by 256GB flash for $1699 (£1449). So just to recap: that's more speed and power, for less money. Thanks Apple. 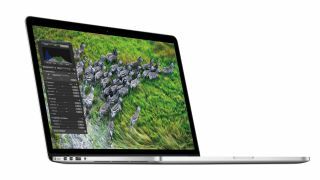 Hopping up to 15-inches, the Retina-toting notebooks come in new quad-core 2.4GHz and 2.7GHz flavours, with the top of the range 15-inch MacBook Pro Retina model also offering 16GB of memory. No price cuts on these bad-boys though. To round things off nicely, Apple has seen fit to take the 13-inch MacBook Air 256GB flash edition down to $1399 (£1,199) from $1499.